Amidst its dire assessment of what’s ailing us, Confronting Capitalism delivers a heartening message: We can turn things around. Movements toward shared prosperity and a higher purpose are reinvigorating companies large and small, while proposals abound on government policies that offer protections without stagnation. Kotler identifies the best ideas, linking private and public initiatives into a force for positive change. Combining economic history, expert insight, business lessons, and recent data, this landmark book elucidates today’s critical dilemmas and suggests solutions for returning to a healthier, more sustainable Capitalism—that works for all. In one dramatic swoop, the Great Recession exposed flaws in the financial industry and the danger of bubbles. But the subsequent fallout has revealed more—structural weaknesses so severe that they threaten our nation’s economic health and the welfare of our democratic society. The problems are immense: a scarcity of well-paid jobs, underemployment, heavy consumer debt, and a scandalous number of children living in poverty. Multinationals and the megawealthy tuck their money into tax havens, while the rest of us—the middle class, the mom-and-pop businesses, the strivers grasping for a better life—just barely hang on. Capitalism is not working like it used to, concludes Philip Kotler, a renowned business thinker and classically trained economist. Fourteen interlocked forces are undermining our once exceptional market economy, which now struggles to sustain its roles as the engine of growth and prosperity and as a rudder in turbulent times. 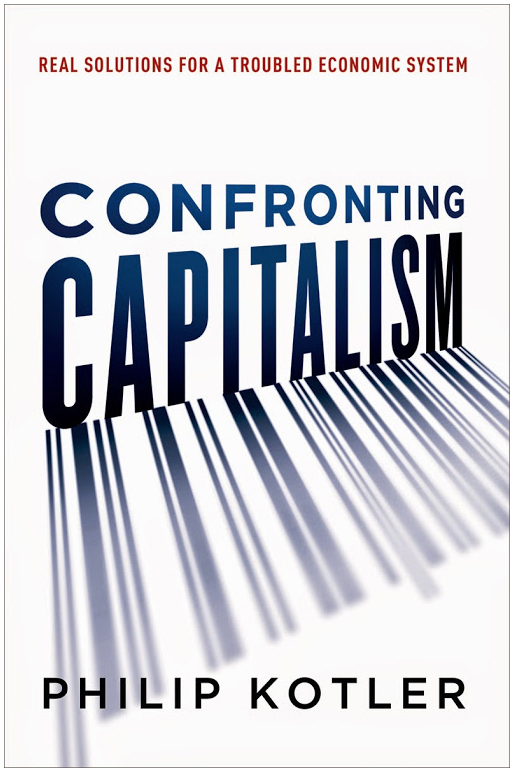 Confronting Capitalism delivers a sweeping assessment of the vulnerabilities in our system. Cutting through the noise—the political squabbles, finger pointing, and strident ideologies—it carefully analyzes what’s gone wrong. It synthesizes a vast amount of data, analysis, and ideas, considering opposing arguments and identifying the ones that stand up to scrutiny. And it offers dozens of suggestions for fixing problems and buffering weaknesses. Every shortcoming—the financialization of the economic system, companies’ short-term growth and profit objectives, insufficient investment in the infrastructure, neglect of the environment, and more—is linked, and each surmountable. Confronting Capitalism maps out the most pressing challenges we face as a nation, and plots a bold new direction for achieving a society that offers a better and fairer chance for all its citizens.